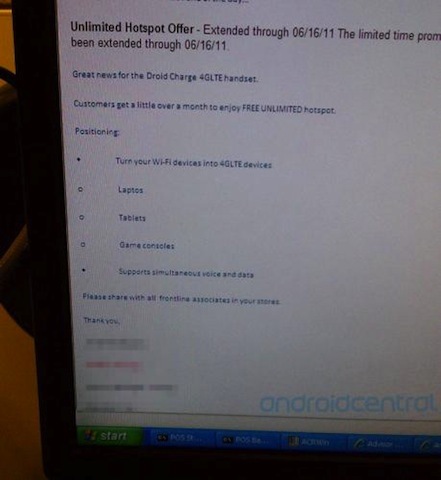 Verizon has extended the Samsung Droid Charge and HTC Thunderbolt free mobile hotspot promotion until June 16 dThe Charge was scheduled to be released on April 28, but was unexpectedly delayed on launch day. The phone is available starting today online and from Verizon stores. Since the delay caused the device to be pushed back, Verizon has decided to extend the trial for a little over a month. Hello my friend! I want to say that this post is awesome, nice written and come with almost all vital infos. I would like to look more posts like this . I?ll right away seize your rss as I can not find your email subscription hyperlink or newsletter service. Do you’ve any? Please let me realize so that I may subscribe. Thanks. I enjoy what you guys are usually up too. This kind of clever work and coverage! Keep up the amazing works guys I’ve incorporated you guys to our blogroll. With havin so much written content do you ever run into any issues of plagorism or copyright infringement? My website has a lot of completely unique content I’ve either written myself or outsourced but it seems a lot of it is popping it up all over the web without my permission. Do you know any techniques to help reduce content from being ripped off? I’d really appreciate it.